Craig Paterson has won the North East Suffolk Club's annual flock contest. Turriff breeder Craig Paterson has been crowned cream of the crop in the North East of Scotland Suffolk Club’s annual flock competition. Mr Paterson was awarded the top title by judge Jim Farquharson, from The Horn, Errol, after standing reserve overall in the contest for the past two years. He took the top award after winning the prizes for best medium-sized flock, best flock of ewes and best ram lamb. Mr Paterson started his Cranorskie flock in 2012 and it now stands at 30 ewes, alongside an 11-ewe flock of pedigree Texels with the same flock prefix. 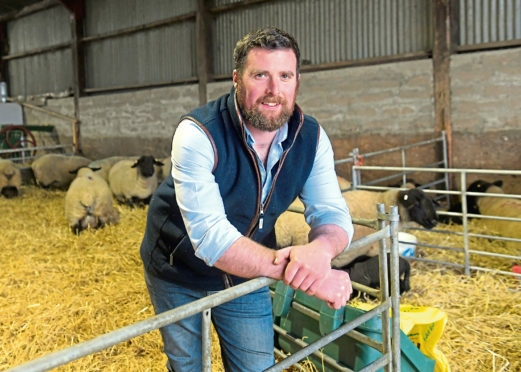 “I was brought up around sheep and always fancied Suffolks so I bought my first two ewe lambs and started the flock,” said Mr Paterson, who hails from Cranna Bridge, Aberchirder, and works as a self-employed contractor in the sheep sector. He said his flock highlights include winning the Suffolk breed championship at the New Deer, Turriff and Keith Shows last year, as well as the overall sheep interbreed champion at Keith. The flock also enjoyed success at the Aberdeen Christmas Classic in November when Mr Paterson achieved his best price of 1,600gn for a gimmer. The reserve overall champion title went to father and son duo Pat and Rory Machray for their Middlemuir flock based at Beech Lodge, Daviot, Inverurie. They also took home the prizes for the best flock of ewe lambs and best stock tup. Other prizes included the best small flock award to Faith Miskelly for her Corrybrae flock based at Kildrummy, and the best large flock award to Judith Lorimer for her Cadgerford flock based at Kingswells. The prize for the best female went to Stewart Duncan, who runs the Pennan flock at Jacobshall, Gamrie.